Slogging through the gray days of our shortest month, that somehow seems twice as long as any other month, is always a challenge. We lean on a couple of crutches to get us through — the hope that warmer weather is just around the corner inspired by the occasional bright spring-like day and comfort food. 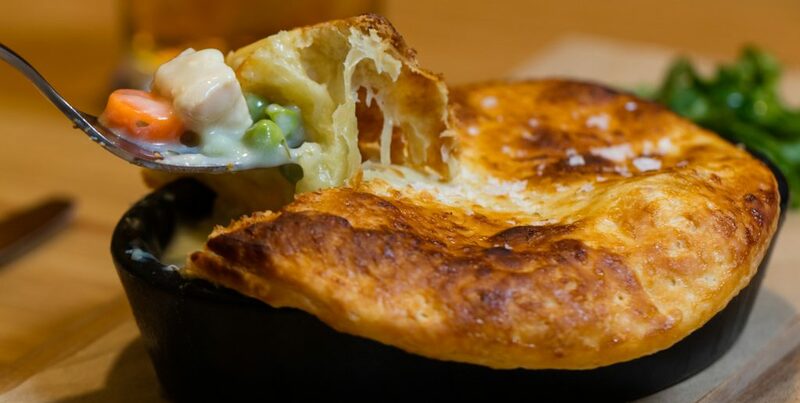 What could be more comforting than chicken pot pie? That nostalgic scent of bubbling broth, chicken and veggies capped by a golden circle of crust. That first piping-hot forkful always scalds the roof of your mouth because you just can’t wait. Chicken pot pie is hard to find while dining out, but we found one right in Russellville at the Courtyard by Marriott. C&M’s chicken pot pie might ruin your memories, though. It’s big. It’s beautiful. And it’s made in-house and from scratch. C&M pairs their chicken pot pie with arugula greens tossed in a tangy lemon vinaigrette dressing to cut the soft creaminess of the pie just a bit, in effect, cleansing your palate in preparation for the next bite. Couple delicious food with C&M’s streamlined retro atmosphere that can take us Generation Xers back to the 60s-70s era interiors of our childhood homes — if our homes had been cooler and more Don Draperesque — and you’ve got a perfect evening out with that special person in your life. Or maybe just go alone and have the chicken pot pie yourself.